this scrub is soft like a cream cleaner but still exfoliates nicely. after one use, my acne decreased dramatically. i can tell that it is refreshing because it tingles when i use it. i love this stuff! It has a creamy consistency with light kiwi green color. Not too many scrub beads, but what I dislike about the product is the smell. It does not smell natural but chemical. It tingles nicely, and cleans but a bit weak for my oily skin. I have not seen any results, and it certainly does not help with the "stress" of acne. 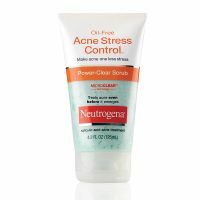 I have always been a fan of Neutrogena products and I especially love those geared toward acne, as I have suffered from it/dealt with it for the majority of my life. I will literally try anything in hopes of clearing up my cystic acne. The size of the bottle is on the smaller side but it is not incredibly expensive and can be purchased at most mass retailers. It has small textured beads that are s...read moreupposed to exfoliate skin and my skin did feel incredibly soft after using it. The scent is nice too, fresh and smells kind of fruity. It did not clear up my acne, but nothing else has including multiple prescription products so maybe my expectations were exceptionally high. I ended up using the rest of it as a body scrub because it was not effective on my face at all.